Tuscan Kale will take longer to cook than chard or spinach, usually 15- 20 minutes. Slice stems away from leaves by folding the leaf length wise and slicing along the stem. Parboil or sauté before adding to omelets, frittatas or vegetable sautés. 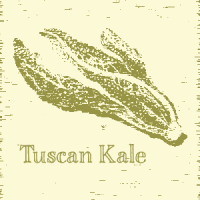 Tuscan Kale is an Italian heirloom with savoy-textured, deep green leaves. This mild, tender, non-heading cabbage may be steamed, served with butter or vinegar; kale leaves can be blanched and used like cabbage leaves to make stuffed rolls.